Astronomers have discovered a giant galaxy cluster - called Massive Overdense Object (MOO) J1142+1527 - that sits in one of the most remote corners of the universe. According to the Jet Propulsion Laboratory, it looks to be one of the biggest clusters ever found, and with it sitting so far away, the above image showcases the cluster as it was about 8.5 billion years ago, much before the formation of Earth. You can see the image in full here. "Based on our understanding of how galaxy clusters grow from the very beginning of our universe, this cluster should be one of the five most massive in existence at that time," said JPL's Peter Eisenhardt. Galaxy clusters are essentially groupings of thousands of individual galaxies that are pulled together by gravitational forces in the surrounding spaces. Our own galaxy, the Milky Way, is part of a small cluster known as the Local Group. For a size comparison, the newly discovered galaxy is about quadrillion times the size of our Sun. "But that was 8.5 billion years ago, and by now MOO 1142+1527 will have grown to be several times larger," Eisenhardt told techradar. The cluster was found using NASA's Wide-field Infrared Survey Explorer (WISE) during a survey of the skies in 2010-2011. Astronomers then used NASA's Spitzer Space Telescope to capture the cluster in more detail, while data collected with the Combined Array for Research in Millimeter-wave Astronomy (CARMA) telescopes in northern California was used to estimate the cluster's size. 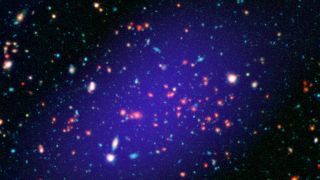 JPL and NASA are hoping to discover more about the nature of dark energy in the universe by measuring "the expansion history of the Universe and the growth of massive structures, the formation and evolution of quasars and galaxies finding extremely distant examples of both from the first billion years of the history of the Universe," Eisenhardt explained to techradar. Dark energy is an unknown form of what is described as energy, which astrophysicists theorize to permeate across space, between galaxies, and could be causing the universe to expand, as well as causing the speed in which expansion is occurring. They are also trying to discover "whether habitable planets are common beyond the solar system, by finding more examples of Earth size planets in Earth-like orbits around Sun-like stars and studying them in detail," he said. "Clusters of galaxies play an important role in the first two goals, in part because they can act as gravitational magnifying glasses for very distant galaxies." Unfortunately, Anthony Gonzalez of the University of Florida, a lead author of a new study in the Astrophysical Journal Letters, explained to techradar that the CARMA telescopes have recently been shut down due to a shortage of funding. "Thus, in the future we will have to rely on other means to measure masses for clusters such as this one from our program," Gonzalez said. This cluster, however, is now being observed as part of a Hubble Space Telescope program, which is currently searching for distant supernovae in galaxy clusters to try to understand the nature of dark energy.